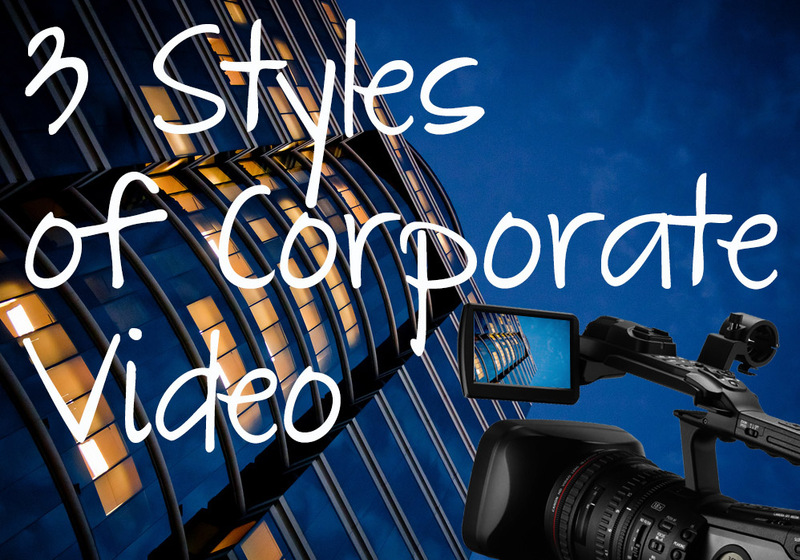 In part 1, I talked about the 11 categories of corporate videos that I see on YouTube. I often see people confusing types of videos with styles of video. Animation, for example, is not a category of video but a style. The animation style is better suited to certain types of videos (explainer and overview videos) than others (I haven’t seen animation used in customer testimonials before) but it is best to separate the two. When you are tasked to create a type of video, you should then look for the style that is best suited to that: working the other way around is putting the cart before the horse. When you ask a client what kind of video they want to make, and they answer “Something animated” you need to cut to the type of video they really want before you get to the medium to render that message. You can also use a combination of styles: elements of screencast, animation and live action are often all blended together in overview videos, with high production values. interviews – the trend in corporate video (and TV) is to have the interviewer off-screen and, usually, unheard but with the interviewee addressing them, rather than looking directly into the camera. In a controlled environment you would hope to have at least 2 cameras running but in the field, like the demo-grounds of a conference, you’ll probably only have a single camera which makes editing more of a challenge. address to camera – this is more like a news anchor or video blogger talking directly into the camera. multi-camera: several camera rolling once. This is typically how the news, talk shows and comedies with a live audience are shot. 2D – traditional style animation (think Bugs Bunny and South Park). Not cheap but quite often used to good effect by marketing departments when they have the budget. These kind of animations are typically created in Adobe After Effects but a more user friendly approach (for a fee) is something like GoAnimate or Prezi. 3D – modern, computer style animation (think anything by Pixar). Rarely seen in the corporate video world due to the time and expense involved but, as those barriers to entry drop, we’re likely to see more of it in the corporate video world and there are already some examples out there. Probably the most expensive and time consuming kind of video you can embark on. typographic – text heavy animation. These play well at conferences playing on big stages while the audience comes in and for the walk on and off of the presenter. They can be understood without the soundtrack. whiteboard animation – has been recently popular in the corporate video world. At its simplest it is just a person drawing on a whiteboard and explaining a concept in real time (think Khan Academy). At the higher end it is scripted and contains time lapse sections and animated sections with the RSA videos being a famous example of these. These can be created in an organic way, by filming someone drawing on a whiteboard, or using specialist software like VideoScribe. VideoScribe does a great job of creating whiteboard style animations even if you can’t draw, for a monthly fee. stop motion – think Wallace & Gromit (expensive and specialized). The bread and butter of software demonstrations, etc. Either recorded using special software that runs on you Mac, PC or Mobile or filmed with a camera pointed at a screen. Both have their pros and cons: when you save direct from the screen it is very clean but it can look strange to see a ghost typing on an iPad so some people prefer that you film the screen being used so that you see the interactions between the user and the machine. This is an aesthetic decision but everyone seems to have a strong opinion about it. I added this just to see if you were awake. Viral videos are neither a type, nor a style, and anyone who tells you otherwise either doesn’t know what they’re talking about or is conning you. Jimmy Kimmel may be able to manufacture a viral video but hardly anyone else can and why would you want to? Web video as all about targeted viewing not getting millions of teenagers to like your video. Forget about going viral and concentrate on making quality, relevant content. Of these types (and styles) of videos, not all are suited to the one-man-crew on a low- or no-budget project. The one-man-crew is not going to cover all the event video needs for a big conference, nor would you employ him to make your Superbowl ad. At the other end of the spectrum, a union, multi-person crew is not appropriate for a video blog. Somewhere in the middle is where the conflict arises. A testimonial video can be shot by a small crew when there is budget, or by one person if they know what they’re doing when money is tight. The resulting videos may not be very different from the end-viewer’s perspective but the territory is where one can get in trouble and get the wrong kind of attention from management and the central marketing department.